As the first of the current genre of Card Driven Wargames, We The People has done an exceptional job of maintaining popularity while being out of print. This event is unique in being able to fold a novice bracket into the tournament that allows newcomers to break into play without being fed to the sharks. We the People enjoyed another very successful year. The usual suspects amongst the perennial competitors were joined by 11 (!) tyros in our coached division. Six former champions, includng the last five, were on hand to stock the shark pool. With such a nice turnout, it took four rounds of Swiss competition to complete the Quarterfinals bracket of the Single Elimination portion of the event. The Swiss portion featured many surprises and hard fought contests. Two-time champion Marvin Birnbaum was ambushed in the first round by Mike Brophy. Randomly drawing opponents did not suit Keith Wixson who in three successive Swiss rounds faced three former champions in John Poniske, Paul Gaberson and Marvin Birnbaum. The defending champion, Chris Byrd, ran into a former champion on a hot streak, George Seary, in the third Swiss Round. That defeat forced Chris to face Marvin in the fourth Swiss round. Marvin, keyed up and vigilant from that first round ambush, was able to prevail and thus unseat the defending champion. John Poniske, 2004 Champion, had a long day as well. His first round match was against the always dangerous Keith Wixson. Surprisingly, these two played a game with a zero bid. Unsurprisingly, the Americans defeated John's British. Back on track after a second round victory, Poniske then encountered talented local up and comer, Jonathan Squibb from nearby Carlisle PA. Squibb dashed Poniske's hopes, but then, in the fourtth round, had his dashed in turn by Brophy, the giant killer, whose victory over Birnbaum was no longer looking like a fluke. Veteran Joe Collinson, broke out of the pack this year with three victories in the Swiss rounds to get one of the byes into the Quarterfinals. Both Gaberson and Seary also made it undefeated through the Swiss Rounds, but they didn't take the easy path either. Seary had to pass defending champion Chris Byrd. Gaberson had to defeat both Wixson and former champion (and eventual winner) George Young along the way. Two time champion Brian Mountford met up with last year's "Rookie of the Year", John Faella. They fought to a tie, but were undefeated going into the fourh Swiss round and so also earned a bye into the Quarterfinals. Another journeyman and all around good guy, Mike Mitchell battled his way into contention, but drew George Young in the fourth Swiss round. Having to face both Young and the hot-handed Brophy proved to be too much for Mitchell; but his steady improvement each year has everyone wary of this veteran. When the dead were buried from the Swiss rounds, the Quarterfinalists were top seeds Gaberson, Collinson, Seary followed by Mountford and Faella. Survivors of that brutal fourth Swiss round - Birnbaum, Brophy and Young - completed the bracket. Gaberson took the Brits plus four PCs, but Birnbaum prevailed anyway. Collinson defeated Faella. Seary topped Brophy and Young ended Mountford's day. The semi-final bracket saw Birnbaum end Collinson's hot streak while Young did the same to Seary. Joe Collinson earned his first WTP wood third) by defeating George Seary in the consolation round. John Faella improved to fifth place from last year's initial sixth place laurels by overcoming Paul Gaberson to put the finishing touches on any possible team points. The Final paired former champions Marvin Birnbaum and George Young. Surprisingly, for those who thought they knew his bidding style, Young drew the British and three PCs. The Final saw considerable political action and reaction as the game went into the '80's with the British enjoying a dangerously high colony count. To disrupt the British hold on colony rich New England, Birnbaum sent Washington to take control of Boston. Young had the card he needed, and was able to chase and capture Washington during his bold move. This was especially ironic. Last year, Young lost the Final as the Americans when the British were able to capture Washington; this year he in won in the same fashion! So instead of crowning our first three-time champion, we now have a trio of two-timers: Brian Mountford, Marvin Birnbaum and George Young. This year, We the People was a coached event and it attracted 11 players with recruit status. 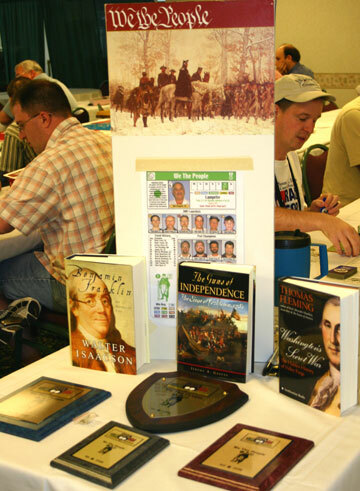 Rob Olsson prevailed in the pure Swiss coached division to win this year's Minuteman Militia Award: a copy of Thomas Fleming's "Washington's Secret War". Our Valley Forge Award is presented annually to a player who demonstrates remarkable fortitude and commitment by continuing the struggle despite outrageous fortune and disappointing defeat. The Von Steuben Award is presented to a player who most contributes to the training and development of our newest players. This year the awards were combined by tournament mainstay Randall MacInnis. He received a copy of Jerome Green's "The Guns of Independence". Our Sportsman Award is named in honor of Captain John Paul Jones. Captain Jones, as every school child knows, was a high spirited warrior who was relentless in his pursuit of victory. What is less well known is that he fought all of his engagements with a strict adherence to the rules and customs of the day. He was determined to acquit himself not only as the victor but to bring honor to the Continental Navy and on himself. For example, when he raided Whitehaven and St. Mary's Island, his crew took as a prize the family silver of the Earl of Selkirk. It was a legitimate prize and its taking caused considerable consternation to British nobility and uproar in Parliament, which was his military objective, Yet Jones' personal sense of honor was such that "war should not be made upon the Fair". So at the condemnation hearings of the Prize court, Captain Jones purchased the silver with his private funds and had it returned to the Lady Selkirk. As in the past, we look for nominees who walk the fine line between competitiveness and a strict sense of personal honor. The winner of this year's John Paul Jones Sportsman Award and our nominee as the WBC Sportsman of the Year is Greg Schmittgens. Greg is a skillful competitor who keeps everything in perspective. He not only plays a splendid game, he literally cheers when great plays are made against him. For him, the enjoyment of the game is the main reward, and seeing a game's "story line" unfold by the twists and turns of fate causes genuine delight that is, frankly, quite infectious. No one who plays Greg has a bad time regardless of the final outcome! Greg also engenders and nurtures WBC's growing sense of camaraderie by making and distributing buttons featuring various events and widely sharing his fabulous homemade jerky. The contagious manner in which Greg savors good play, his ready willingness to help GMs and WBC officials, the sense of amity that he encourages throughout the tournament, make this nomination a no-brainer. It came as no surprise to learn that he was independently nominated as Sportsman of the Year by at least one other tournament. Greg received a copy of Fred Anderson's "The War That Made America", the companion text to the superb PBS documentary of the same name. Due to professional and family commitments, there is a very good chance that Don Chappell may not be able to return in 2007. The good news is that George Young has volunteered to perform those duties. He volunteered well before play started and thus did not realize that he would also be the defending champion. So being the GM will make that defense more challenging! However, our constituency is well behaved, the game is well understood, and play (for the most part) keeps onpace, so it won't be THAT hard on him either. Unfortunately, administering the coached division while playing competitively is quite impossible. So if we are to remain a Class C (coached) event next year, we will need a true Von Steuben to step up and lead that division. We definitely don't want the defending champion unable to defend his title! Volunteers for the duty should contact Don Chappell well before December so that the event proposal can be updated, handed off to George and be submitted on time. 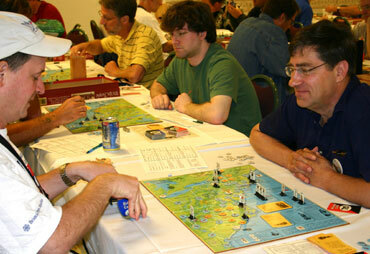 WE THE PEOPLE: The PBeM Tournament started on January 14 with 50 participants. The six round Swiss tournament should run for approximately two years. A large number of top players are participating. Favorites for the wood include past WBC Champs Marvin Birnbaum, Brian Mountford, George Seary, James Pei and George Young and defending BPA PBeM Champ Paul Gaberson. 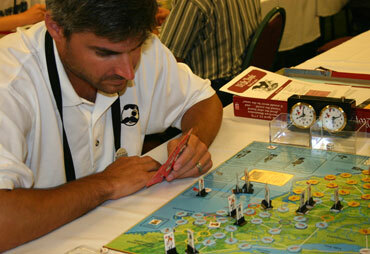 This game served well again in its capacity as a time-filler among the rounds of the other events taking place at WAM. Twenty players entered the WTP event, run as a swiss, last-man-standing elimination event with the plaque going to the final player without a loss. In the winners bracket, the usual suspects knocked down contenders. By Sunday morning, four players remained undefeated: Paul Gaberson, George Young, James Pei, and Pete Reese. With the Wilderness War plaque also within his grasp, Reese decided to drop out of the WTP competition. This left Pei to match up against Gaberson for the right to play Young for the plaque. Pei reached this point via a draw against Randall MacInnis and wins over James Terry and Stuart Tucker. Gaberson had vanquished Chris Byrd, Pete Reese (in the mulligan round), and Terry Coleman. Young had defeated Terry, MacInnis, and Roderick Lee. Against Gaberson, Pei (bid 3 PCs to be the Americans) managed to draw Campaign cards in four of the first five turns. The Americans had four unanswered plays at the end of 1777. The British Regulars Advantage was lost in 1779. The War ended in 1780 without a single colony under British control. In the Final, Young won the bid at 4 PCs to be the Americans, only to be hobbled by never seeing the Declaration of Independence and French Alliance. Benedict Arnold turned coat in 1777. The British Regulars advantage was lost in 1778, but on the turn it mattered most, the final turn (1779), Pei had a Campaign card and managed to control six colonies to win the game and the plaque. Over the course of the tournament, bids for the Americans increased, to the 3s and 4s, while averaging just under 3 for the event. Tucker, upon losing to Pei, heard him say that he believed 4 PCs was a fair bid to be the Americans. Certainly, Pei showed his proficiency in keeping alive Washington against Tucker. Tucker had established a 4-pronged attack that established a loose ring around Washington in Albany. But Pei managed to maneuver his other generals on the flanks at the right times to catch the British advances in dangerous terrain, killing many of them due to lack of a retreat. Despite having overwhelmingly better cards than Pei, Tucker's British managed to lose most of their CUs by 1778 and resigned--all while Washington rested in Albany. Of the 22 games, the Americans won half (11), while two were draws and nine were British wins.